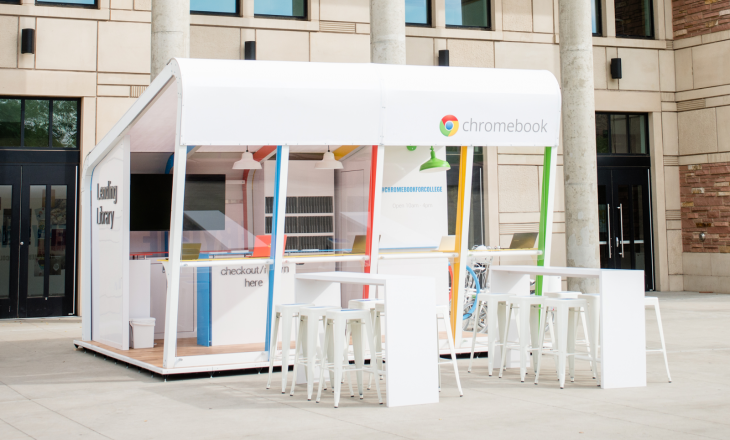 Google is making moves to promote Chromebooks in colleges later this year, as it announces a new Chromebook Lending Library initiative. However, the library won’t be available internationally, or even nationally. It’s only being introduced to 12 institutions in the US – and even then it will only be available for 4-day stints. So in effect, it’s really more like a traveling pop-up shop. Students will be able to borrow Chromebooks for use on-campus during the week. It’s an interesting endeavor for sure, but when most students will surely have their own laptops, it’s not clear how popular this will prove. If nothing else, it will let students try them out for battery-life and general functionality, before deciding whether they’re a worthwhile investment for the long-haul. The library will be arriving, at different times, at: Auburn University, ASU, Central Florida, GW, Pennsylvania State University, Syracuse at Walnut Park, Texas A&M University, Texas State University, UCLA, and the University of Colorado, Boulder.